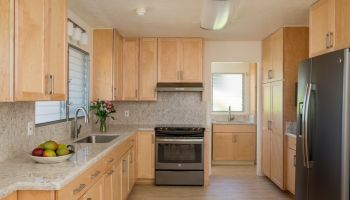 When the Higaki family was planning the kitchen remodel in the attached mother-in-law's ohana unit in their multi-generational home, they knew they needed to find a name they could trust. Being previous clients of Homeowners Design Center, a local full-service design and kitchen remodel company, the Higakis had been more than pleased with the previous kitchen remodeling work completed by the company, so they decided to reach out once more to designer Jessica Omoto and her Homeowners Design Center team for help in “cooking” up some great kitchen improvements. Small galley kitchenette transformed into full, open kitchen. Kitchen remodel involved taking down two walls to double the size of the kitchen. After the walls came down—nearly doubling the size of the kitchen—the team focused on improving function, which, according to Omoto, meant adding drawers or roll-out trays for smart storage and added visibility when accessing cabinets. And although the project came out beautifully, Omoto admits that concocting this kitchen remodel was no easy recipe. “Our biggest challenge with single-wall homes is that they have a lot of exposed beams and posts that we need to work around and make allowances for,” explains Omoto—an obstacle which the design team handled without flinching, like the champs they have earned the reputation for being! Double-sized kitchen more than enough space for mom to enjoy and cook independently. For cabinetry, Omoto shares that the team opted for the Diamond brand in traditional, yet highly versatile, Shaker style, cherry wood with a dark, chocolate finish. “It gives it a nice richness, while also providing a nice contrast to what we had going on with the countertops,” says Omoto. They went with two varying shades of white quartz—one bright for the island from Silestone and a sparkle sheen for the sink counter from LG Viatera. To round out the kitchen remodel, the flooring chosen was vinyl plank from Engage, selected for its winning combination of high-durability and low-maintenance. Mother and daughter teamed up to choose the appliances, hood and the lighting after all of the finishes had been chosen. In order to match these above-mentioned selections, the daughter and mother Higaki family duo took charge of choosing the appliances and lighting fixtures. The pair picked a very tasteful, modern range with elegant hood and glass doors flanking either side, and stunning turquoise pendant lighting that really pops. All in all, the kitchen remodel came out tasteful and satisfying to all involved. 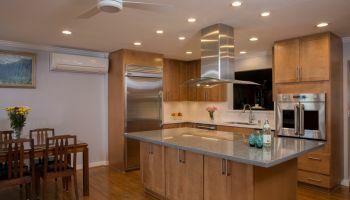 To see more projects by Homeowners Design Center, or to find out how they can help you with your kitchen remodel, click on any of the photos above or wherever you see the company name.